A native of Atlantic City, NJ, Lieutenant Commander Brandon was commissioned in 1987 after receiving his Bachelor of Science degree in Finance from Hampton University. His first tour of duty was onboard the USS Cape Cod (AD 43) where he served in a variety of division officer billets in the Deck and Engineering Departments. During his tour he was directly responsible for Cape Cod becoming the first destroyer tender qualified to handle, store and transport Tomahawk and Standard Missiles. He participated in two Western Pacific deployments, the second was highlighted by participation in Operation Desert Storm. LCDR Brandon transferred to USS Josephus Daniels (CG 27) where he served as Systems Test Officer (STO) and later as Weapons Control Officer (WCO). As STO he was directly responsible for the successful installation of the New Threat Upgrade (NTU) Combat Systems Suite. As WCO he ensured the ship had a successful CSSQT, NGFS, COMPTUEX and Eisenhower Battle Group work ups in preparation for her deployment to the Mediterranean and Adriatic Sea, where she served as Adriatic Red Crown. His next tour was as instructor for the PCO and PXO NTU course at Fleet Combat Training Center Atlantic (FCTCL). Upon transfer from FCTCL, LCDR Brandon attended Department Head School and after graduation was assigned to the USS KIDD (DDG 993) as the ships Combat Systems Officer. 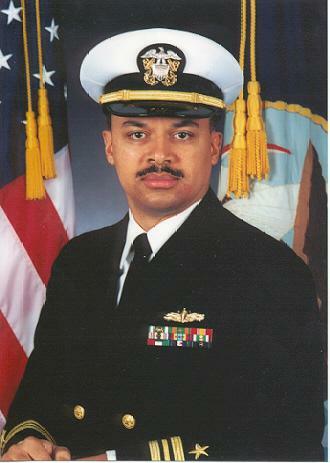 LCDR Brandon served in USS KIDD (DDG 993) from October 1995 to March 1997. During this tour he planned and executed a live fire exercise of 10 Standard Missiles, the highlights of which included a Commander Naval Surface Forces Atlantic requested maneuvering target exercise. He then reported to Commander, Destroyer Squadron EIGHTEEN as Combat Systems Officer. Destroyer Squadron EIGHTEEN deployed to the Mediterranean Sea and performed the duties of Commander Task Force 60 and Tomahawk Launch Area Coordinator during Desert Fox. In March 1999 LCDR Brandon reported to the Naval War College where he earned a Masters Degree in National Security and Strategic Studies. His decorations include the Navy and Marine Corps Commendation Medal with two gold stars, the Navy and Marine Corps Achievement Medal with gold star and various campaign awards.